There is a lot more to training that just “show and tell!” The training facilitator is a catalyst, coach, educator and more. In order for learning to stick the facilitator must facilitate a memorable learning experience rather than a training event. Leave your trainees eager and able to implement what they have learned! Increase your knowledge on how participants acquire knowledge and skills rather than merely receive them. Presenter: Luanne Stevenson has over 18 years of leadership and management development experience. As a facilitator and coach, her clients include Fortune 100 companies, universities and leading training and outplacement organizations. Luanne has a Masters of Arts degree in Management and a Bachelor of Arts degree in Organizational Communication. She is a recipient of the YMCA Woman of the Year award, held elected office as President of the Mental Health Association, Yolo County and VP of Marketing for the Mt. 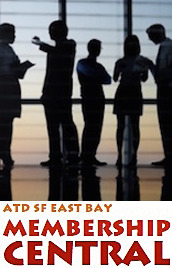 Diablo Chapter of American Society for Training and Development (ASTD). She is a faculty member at American Management Association (AMA), Chapman University, Las Positas College and previously University of California Extension, Davis.